When my husband and I got engaged in 2005, we had…well, almost nothing. I was making around $12 per hour at the time and living with my parents while I endured our long-distance relationship. Meanwhile, Greg was finishing mortuary school and living in a crowded apartment on the top floor of a funeral home. 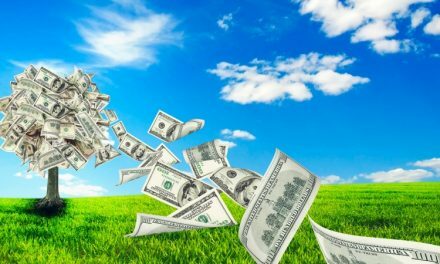 Between the two of us, we had two cars – one of which still required a $500 monthly payment, some old clunky furniture, and a few thousand dollars in credit card debt. But we did have love for each other, and lots of it. And since my husband was getting ready to graduate mortuary school in just a few months, we knew our financial situation would get better in a hurry. Still, I didn’t want to go “all out” for our engagement or our wedding. So, when we started talking about marriage and shopping for rings, I hinted around that I didn’t want anything fancy. I loved sapphires, I told him, and I absolutely did. As an added bonus, I knew we could save money by avoiding a large center stone. Related: Separate Finances: A Recipe for Marital Disaster? By the time we got engaged on July 10, 2005, he had gotten the hint – and I ended up with this beauty. For just $450 and a little more on the diamond wedding band, I had a ring I loved and wanted to wear forever. And no, I wasn’t the least bit disappointed I didn’t get a big, fat diamond ring for our engagement. I just wanted to marry the person I loved, after all, and I didn’t want to start our marriage with thousands of dollars in new debt. It’s as if they think my old ring isn’t good enough somehow, or as if my husband owes me one. I have even felt as if certain people look down on my old ring and assume my husband doesn’t love me enough to buy me a better one. The strange thing is, I have never once wanted a different ring than this one. And even though we have more money money now than we did when we got engaged, I have never daydreamed about a giant, shiny diamond instead, or wished my husband would surprise me with a bigger ring to show his love. My engagement ring represents where we started. Sure, we’re in a better financial place now, but this ring represents where our journey began. To me, it represents a time when my husband had only a few dollars in his name, but was more than willing to spend it all on me. It represents the purity and strength of our love before we got married, had kids, and life became much more complex. I can’t imagine replacing my engagement ring with something bigger and better just because we’ve moved up in the world. I got this ring when I was twenty-five-years old, and at the time, it was everything. How could I give that up? I don’t need material possessions to be happy or feel loved. Another reason I don’t feel the need to upgrade is the same reason I don’t upgrade everything in our lives. It’s the same reason we live in a fairly modest house, drive older, paid-off cars, and buy clothes at garage sales. I don’t need material possessions or even nice things to feel loved, nor do I need them to display my wealth to others. In a lot of ways, this ring represents me and fits my style just fine. When my entire wardrobe is probably only worth a few hundred bucks, why bother with an expensive ring? I would rather save the money for our children’s college, a really nice vacation, or basically anything else. I haven’t shopped for jewelry for a while, but I know most nice engagement rings cost several thousand dollars at the very least. Maybe it’s the “mom” in me, but I would rather save that money for something that could benefit everyone. With a few thousand dollars, we could take a really nice family vacation somewhere fun. Or, I could stash that money away in my children’s 529 plans that let it grow over time. As I get older, I get more and more in touch with what I truly value in life. For me, that has meant a renewed interest in my family, their well-being, and of course, our financial health. Since a new wedding ring won’t make me happier – and it certainly won’t make me richer – I see no reason to trade in the ring I love for something more expensive. Sometimes, the things we have are “good enough,” and changing them would mean letting go of a part of ourselves. And who says new is better anyway? A lot of times, I’ve found the things I value most are memories, and not possessions. I’ll never forget the way my husband and I met, the sacrifices we made early on, and how much we loved each other despite the fact we had nothing. Fortunately, I never have to forget. All I have to do to remember is look at this ring. It says it all. How do you feel about upgrading your engagement ring? 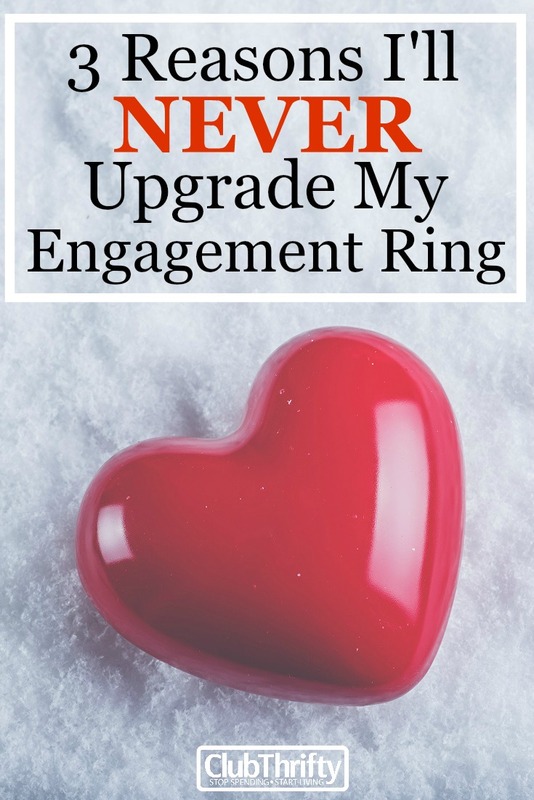 Do you plan to upgrade, or keep your old ring forever? This is such a beautiful post, Holly! My partner and I are not married… yet! I most certainly don’t want a big diamond ring, nor do I want a big wedding. A few of my friends have Tiffany engagement rings and although their rings are beautiful, I cannot justify spending over £10k on a ring! I also want a very small wedding, nothing fancy or expensive. Luckily, my partner agrees on both accounts. I agree – that’s a lot of money to spend! I couldn’t justify it, either. Not then and still not now. My partner brought my engagement ring on Etsy. It’s vintage and white gold and looks like a 1950s style ring ( even though I think it’s from the 80’s) it was only approximately 500 dollars and it has three small diamonds and I love it would never change it, it is so special to me. I love this!!! I know so many people who don’t upgrade even after they could afford to, but I’m surprised how many clients of my firm actually do upgrade every 10 years or so. Not judging either way, but I think it’s really sweet not to upgrade and a symbol of your beginnings and journey. Love it! My husband’s mom passed away when he was 18. His older brother had already married and the younger one wasn’t interested in an “old ring”. That ring means more to me than any he could have purchased. Awww……I bet! I totally understand what you mean! The engagement ring represents where you started. So greatly worded. It’s crazy how much people spend on engagement rings and weddings these days. It’s good to know the ring is symbolic in a way of where you once were! I love your story and what your ring represents. I have never considered upgrading my ring. It only makes sense to keep the engagement ring from getting engaged! Yours is beautiful & obviously meaningful to you. Yes, it is very meaningful! I love it! Our engagement rings (we both wore one) costed about 150 Euro, our wedding rings costed about 300 Euro. I wouldn’t have married a spendthrift. It’s just a piece of metal. The sewing machine he bought for me was more expensive than our engagement rings and it’s much more useful! He is very generous but he is thrifty, too. We both prefer spending our money for people we love but not for status symbols. I hear ya, Anita! I feel the same way! I want to print this out and put it on my coworker’s cube who makes fun of my engagement ring that came from Sam’s Club and my wedding band that came from Kohl’s. He of course has said that he will propose to his girl with a giant rock that costs $$$. I tell him that’s why we honeymooned in Italy (with no debt afterwards) and own multiple properties. Why do people think the amount of money you spend has anything to do with how much you love someone? My husband’s wedding band was around $100. Does that mean I love him less, too? It’s the American consumer mindset that plagues people. They have seen too many jewelry commercials and bought into the propaganda. When it comes to how I would prefer to spend 5K or 10K in “extra money,” there are about a million things on the list and none of them have anything to do with jewelry. I feel the same way. Even though we just got our rings, we weren’t trying to spend much and even though we’re considering upgrading one day in the future, I’d be perfectly happy if we didn’t because there are so many other things I value over a ring and like you said, it symbolizes where you started. One thing I couldn’t stand at the jewelry store was the message on the bag when we bought our rings. It said ‘I am loved’ with little hearts on it. I was like, ugh… sooo just because you have a nice ring from a jewelry store that means you’re loved more than the average person/couple? Get out of here , haha! LOVE this. Ironically, we got ourselves into debt and bought some bling. Now, for our upcoming 20th anniversary, we are putting the bling in drawers and getting plain sterling silver bands. Reason being is that the “bling” often makes people go “WOW – nice ring!” and it makes me uncomfortable, honestly. Our new plain silver bands represent, to us, who we are more so than our bling. We want the simple things in life and couldn’t care less about having bling. After all, it’s not about the ring, it’s about the relationship. My ring is a diamond but it’s small and was very affordable for us at the time (I think it was $650, and a bit more for the wedding band). I love that you said your ring represents where you were at the time! That’s so true! And that’s one of the reasons I also do not want an upgrade. My husband has mentioned it to me a few times and sometimes I’ll get excited and browse the fancy-schmancy ($15K, haha…never) rings at Costco but when push comes to shove, I want to keep what I have forever. It just means too much!! And…I actually only wear the wedding band anyways b/c the diamond gets in my way hahaha. Why upgrade when I’d never wear it?! Love this! This topic comes up so much in my life now, and it came up twice this weekend. Nope, I don’t plan on upgrading mine. Holly, I really like your post. Your ring has meaning, it has sentiment. I live in an area of the world where women are walking around with rocks on their fingers their spouses probably took loans out to pay for and for what to one up the other couple. The ring, the proposal, the moment it should have meaning not a dollar figure. My husband worked super hard to get my ring and it is not huge but it is what we choose together and together we stand to this day. Thank you for your post, have an amazing day. Upgrading just seems odd. Victoria does want to add two (very) simple bands (no diamonds) on the outside of her wedding band, which I guess would count as an upgrade. But it certainly isn’t the same as upgrading to a huge new diamond! I think there are definitely more important things to put our money towards right now than a new ring. I could see me surprising her with one once all the kids are gone and we have more discretionary income. Nothing extravagant though. That’s so sweet! I feel the same way! DH carved an engagement ring out of wood. I don’t wear it. I didn’t realize that some people wear the engagement ring after marriage until moving to a different part of the country where it was common. My parents haven’t worn wedding rings for decades…and they have been married for more than 40 years! I’m with you! I feel like upgrading would be a huge waste of money. Besides, that paid for diamond that I actually got to pick out is just fine with me. Love this! I agree with all of your reasons for not upgrading, but I have a couple of my own to add. The first being HE picked it out for me. His time, effort, and money all went towards this one item for me and I will always cherish that. The other reason is if I ever “did” anything to this ring – upgrade, replace, anything – it would not represent what I feel is a unique bond between us. It is a circle that represents the circle we made and are continuing to make. I wouldn’t do it either. It stays as it is as long as it can. It has sentimental value. Upgrading it would somehow defeats its purpose. I was engaged in 2005 as well. My husband wanted to buy a Tiffany engagement ring for a price that boggled my mind. He would have paid cash, but I was a mental health worker and spent a lot of time in bad neighborhoods, and I was getting ready to graduate nursing school and knew I would be gloving and ungloving all day, and didn’t want that ring to accidentally end up in a garbage can of body fluids. I dickered him down to 50% of the cost, though he still spent way more than I wanted and it was from Tiffany’s and not the fake diamond I wanted. I would never trade it in, thanks to sentimental value, but I can honestly say I would rather we spent that money on paying off student loans even earlier or an extra boost on the mortgage. I have a similar ring with an emerald which we purchased shortly after our engagement when I was 25, and like you I would never trade it for anything! Recently a newly engaged friend’s fiancé quipped when I showed them my rings that he didn’t want to get her ‘anything cheap’ like mine! 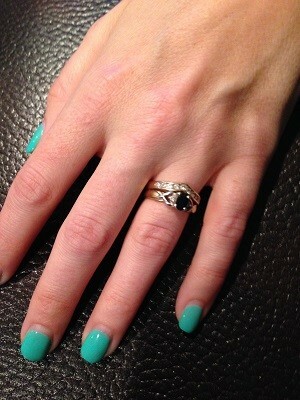 She loved my ring far more than her boring solitaire and said she had always wanted a coloured stone for her engagement. They are gainibg popularity I think! Material possessions are starting to suffocate me. My fiancé spent a fiver on my engagement ring, with my complete blessings, and I love his thriftiness. He’s not cheap, he just knows the value of money and putting thousand of it on a ring is not in our values.